Finally made the time to participate in your challenge again. We are redoing our kitchen, so I have escaped to my craft room in the basement every day this week, so finally have had more than enough time to make cards! 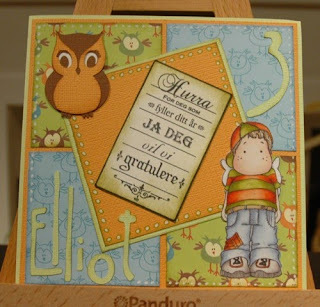 Papers on this card is from the scandinavian producer Panduro, stamp is Magnolia coloured with pro markers, and text stamp is from Papirloftet. Owl is from cricut Happily ever after and font is cricut lyrical letters.